The artist's participatory Reflections of Healing kicks off at the Oakland Museum of California. The Reflections of Healing Celebration and Mural Unveiling is on Friday, Oct. 24 from 4–8 p.m. at the Oakland Museum of California (1000 Oak St.), free. MuseumCA.org or 510-318-8400. During a recent visit to Brett Cook's studio, the local artist sat cross-legged on the floor, in front of more than a dozen uniform file boxes. In socked feet, he looked as if he could have slipped into a meditative state, if not for the energy he radiated when describing his work. In this position, Cook would be a fitting model for his ongoing project, which features portraits of unsung heroes of Oakland, and is titled Reflections of Healing. 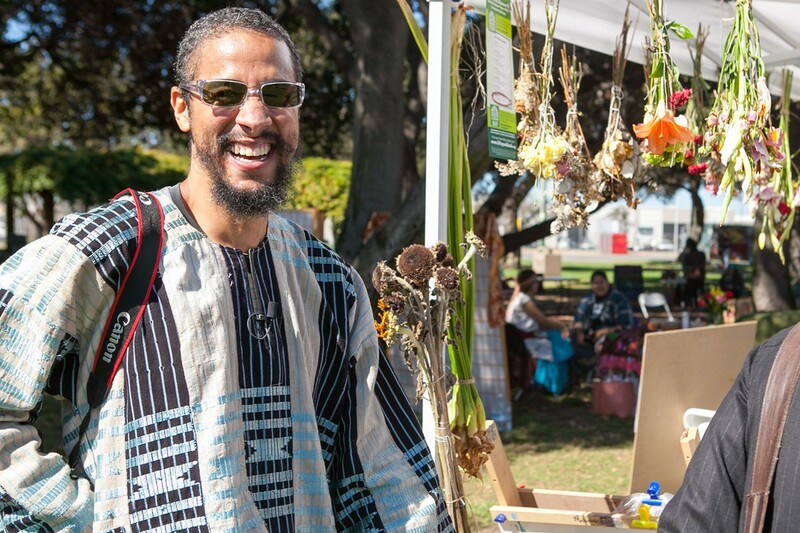 Cook's interpretation of community engagement, a buzzword for so many cultural figures and institutions, is rooted in "building relationships off trust, rather than just hosting events," he said. Cook recently programmed a panel discussion on socially engaged education for the Open City/Art City Festival, hosted an interactive session in the "Art, Activism, and Technology" series at the David Brower Center, coordinated the Reflections of Healing keystone event of the Life Is Living festival, and will celebrate Reflections with an event at the Oakland Museum of California on October 24. The portraits Cook created during his focus on his solo career — which included many depictions of Cook's family, as well as self-portraits, at different times in his life — were relatable and important precursors to Reflections. Often he included ephemera at the bottom of his portraits. In "Documentation of a Grandma" (2010), hairbrushes, pillows embroidered with phrases such as "Grandmothers Are Special," clunky nursing shoes, birthday cards, and a yawning box of jewelry drooling pink pearls were just a few of the objects he chose to arrange. Cook said that, many times, viewers automatically reflect and relate to the portraits' debris, such as how their own grandmother likes playing bingo. Shared experiences anchor all of his projects. Though his art is now popular enough to be featured in big commercial galleries (and net a positive review in The New York Times in 2001), Cook's ideas about art have progressed outside of gallery walls. 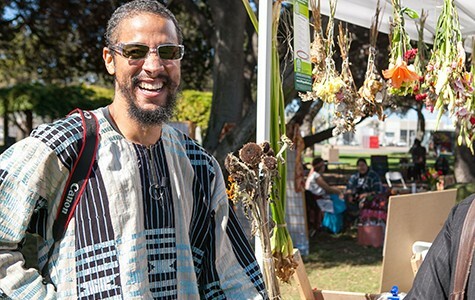 His community projects after his return to Oakland in 2005 best embody his signature use of art as a tool for change. Reflections overwhelmingly features subjects from the Oakland community. Familiar figures include art activist Favianna Rodriguez and poet Chinaka Hodge. All of Cook's subjects come from diverse backgrounds. Reflections isn't just a community craft project, however. Cook had each Reflections subject think of one question surrounding healing and wellness; he then incorporated those questions into his project. Some are more straightforward, such as, "What is the difference between healing and coping?" Others are more abstract: "Where does it hurt?" Once Cook gathered all of the questions, he interviewed each subject with the list. "This allows the participants to dictate the content of their conversation," he said. He pointed out that in historical Western art convention, portrait subjects almost never had a voice. On the Reflections portraits, quotations from the sitters are displayed across the top of the panels. Conflict resolution teacher Kate Hobbs' quote reads: "The earliest hurts have spawned the great work that I have committed to for most of my adult life." Cook asked each community leader for a photo of themselves as a teenager and placed the photo alongside their current portraits, with the aim of reminding viewers of youth's power in creating a thriving community. The gap we see between the baby-faced youth and the adult figure today may encourage young people who feel overwhelmed by the pressure to have a plan to change the world. Cook himself pointed out that he started out at UC Berkeley as a zoology major. In a short documentary video also titled Reflections, Cook said the portraits result in "magnifying the effect of [the subjects'] work" by inciting equal parts reflection and action. These "collectively made objects for healing are community monuments, not filled with the spirit of the dead, but the energy of the living," he wrote on his Flickr page. The biggest change in regard to his solo work is that Cook has relinquished almost all artistic control over his portraits, allowing others at events, such as Life Is Living, to help with the outlining and coloring. "These ideas are absorbed by looking at past, present, and future models of healing by participating in art-making," he said. He described our tendency to associate art with the production of physical objects. But with Reflections, the practice matters most. "In the process, we come to the realization that there are countless people in the community that are doing things to promote healing," he said. At the recent Life Is Living festival, Cook projected the Reflections portraits onto wooden boards so that the subjects themselves, along with friends and family, could trace the outlines, which stretched up to eight feet tall. He then supplied oil pastels for others to color in each smile line, cheekbone, and dimple. Afterward, he took the wood panels and "riffed" on each portrait, adding to the backgrounds to "bring out the spirit" of that person. The works formed cube structures with the participants' questions on the wall adjacent to their portrait. Festival-goers added their own answers to the questions with chalk provided. Though the project began in 2010, this month brings Reflections to much larger audiences. Previously, the portraits had been displayed in Oakland public libraries, but on October 24, ten of Cook's portraits will become semi-permanent public installations on the wall of the Oakland Museum of California (on 12th Street facing Lake Merritt). The event, held in tandem with Friday Nights @ OMCA, will also feature food trucks, performances, live music, wellness activities, and art making. Reflections portrait-making is unpredictable, but Cook is unfazed by impermanence and change. When asked what his expectations were of the project, he rejected the term and referred only to his intentions. The naked black outlines at the start are a bit frightening-looking — decaying, wrinkled, and almost unrecognizable as human. But as the flesh and features are added, thanks to those who come and go at their leisure — some staying for hours — the images take on a life of their own. There's no anxiety about coloring within the lines, either.